In the summer of 701 B.C.E., the powerful Assyrian army ravaged the Hebrew kingdom of Judah and threatened to destroy Jerusalem, the last unconquered city of any size. Scholars agree that if the city had fallen and its people deported, Hebrew culture would have perished. Judaism could therefore not have blossomed several centuries later and its offshoots, Christianity and Islam, could have never existed. Suddenly, the invaders retreated, leaving the City of David intact. Why? The Bible, which tells the story in the Book of Second Kings, says only that an angel slew many of the foe. The real reason for the Assyrian withdrawal has been one of history’s most enduring mysteries. The Rescue of Jerusalem: The Alliance between Hebrews and Africans in 701 BC argues that Jerusalem was saved by the army sent by Egypt’s 25th Dynasty. Historians may disagree on how many of ancient Egypt’s 30 dynasties were black. But all historians agree that least one of them was – the 25th. It was this Kushite (or Nubian) dynasty that sent the army to Jerusalem. This Kushite army seldom figures in modern biblical scholarship – the result, the book argues, of modern scholarship’s blind spot to Africa’s accomplishments. “A special circle in Paradise is reserved for writers such as Henry Aubin: those able to deal with really big ideas or occasions, and to do so convincingly in tight, readable, unpretentious language. The issue here is a terribly big one: (…) why was Jerusalem not trashed by the Assyrians in 701 BC? That was one of those contingent moments in world history on which whole civilizations pivot…. “Aubin argues with real brilliance [that a Nubian-led army repelled the Assyrians]. Yet I doubt his argument will go far: Not that it will be defeated, just ignored. There are few congregations whose rabbis or ministers are apt to be keen on building into their mindset the idea that the Judaeo-Christian tradition was saved from extinction by a bunch of blacks from the Upper Nile. 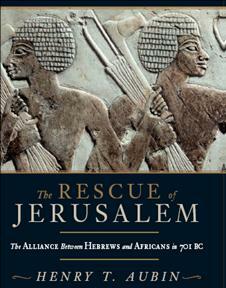 “As someone who has spent much of his professional life studying ancient Egypt and the Sudan, I have read with great interest and admiration Henry Aubin’s The Rescue of Jerusalem. The author addresses a poorly understood, but important, historical episode — King Sennacherib’s abandonment of the siege of Jerusalem in 701 B.C.E., an event which is widely held to have made possible the development of Judaism, Christianity and Islam. In his powerful, wide-ranging analysis, Aubin has demonstrated that a key problem that has hindered the analysis of this event is the pervasive racism that led scholars to discount the effectiveness of the Kushite kings who controlled Egypt during the 25th Dynasty. By successfully countering this image, Aubin is able to construct a highly plausible argument that it was the arrival of an Egyptian army that saved Jerusalem at this time. He is also able to account for why this explanation does not survive in the Hebrew accounts that are available to us. “Aubin successfully achieves his primary goal: he provides the most convincing explanation of what caused the Assyrians to retreat from Jerusalem. In the course of doing this, however, he accomplishes three other goals that in my opinion are of even greater importance. First, he presents the most persuasive panorama I have read of interstate relations from Babylon all the way to Meroe around 700 B.C.E. “Second, his unbiased view of the Kushite rulers of Egypt during the 25th Dynasty completely revises our understanding of Egyptian society at this period. As someone familiar with the evidence he uses, I reproach myself for not drawing the revolutionary and totally convincing conclusions about these rulers that Aubin has formulated. “Third, he has unmasked, thoroughly and effectively, the unconscious racism that has mangled the scholarly understanding of Egypt for more than a century. “I found [Aubin’s] argument about how an Egyptian army led by Nubians compelled Sennacherib’s retreat to be very convincing. So much so indeed that I feel compelled to retract my own previous belief that a lethal epidemic… was what made the Assyrians withdraw. Writing in the Journal of Hebrew Scriptures, a biblical scholar defends Western scholarship of the late 19th and 20th centuries against my charge (in The Rescue of Jerusalem) that racism influenced its dismissive view of Kushite accomplishments — a view that some non-racist scholars today have unwittingly inherited. What is the truth? Make up your own mind. Click here for an informative map of the theatre of war in The Rescue of Jerusalem. The book is published by Soho Press, New York (2002), and by Doubleday Canada, Toronto (2002).